The Archives are composed of two collections: the Manuscript Collections and the University Muniment Collection. 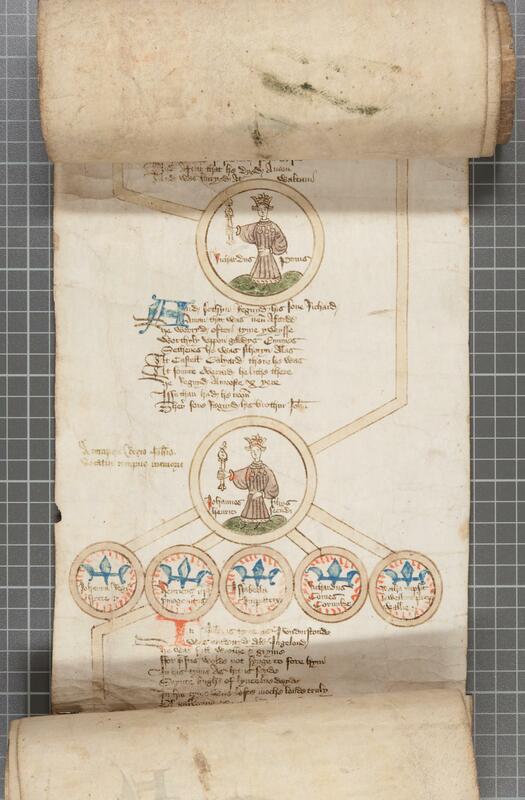 The Roll of Kings, ca.1440-1470, a verse chronicle emphasing succession of line of kings from William the Conqueror to Richard II (ms38660). Since the earliest days of its existence, the University of St Andrews Library has been collecting manuscripts in order to fulfil its role of supporting the teaching and research of the University. In 1959 a Manuscripts Department was established for the specialised care of this type of material. Since then, many and diverse manuscripts and manuscript collections have been added to the Library’s holdings, making the department a vital component of the Library’s support for teaching and research within the University, an important centre for historical studies in the wider academic community, and a public resource centre. It thus holds an eclectic collection of manuscripts, ranging in date and subject from Greek papyri and medieval philosophical treatises to modern business records. The manuscripts are of widely varying nature: single volumes, letters or documents, as well as collections relating to individuals, families and institutions, organisations and movements. Most manuscripts are owned by the Library, but some are deposited by their owners under terms and conditions which vary widely. 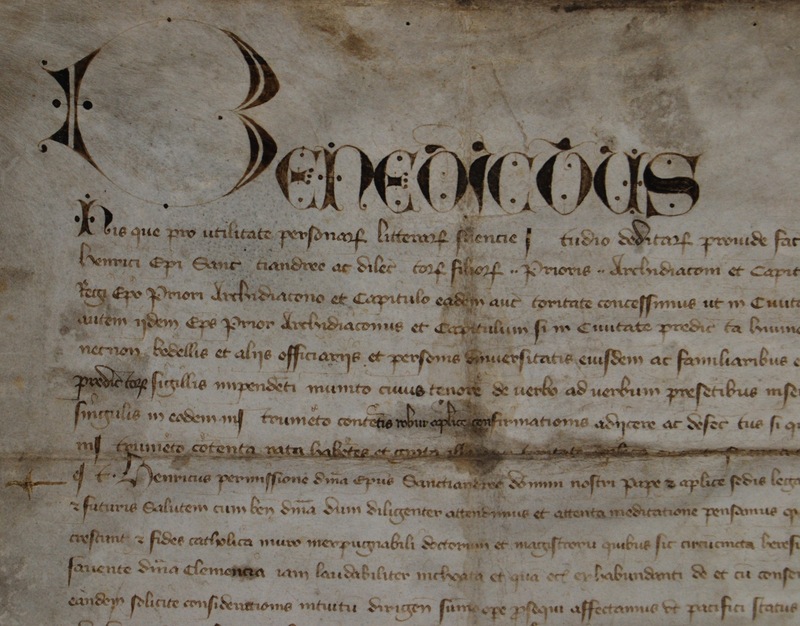 The “Foundation Bull” or the Papal Bull confirming charter of Bishop Henry Wardlaw, 28 August 1413 (UYUY100). The University Muniment Collection – the archives of the institution itself and its constituent colleges – is held within the manuscripts department, under the care of the Keeper of Muniments, which post is at present combined with that of Keeper of Manuscripts. The collection is divided into several parts: the records of the University as a body, of its constituent colleges, and of the Library. The Muniments date back to 1215 and represent the recorded history and corporate memory of the University of St Andrews. Much of the early material relates to the lands, titles and privileges of the University, which was founded by 1410-11 and confirmed by papal bull of Pope Benedict XIII in 1413.